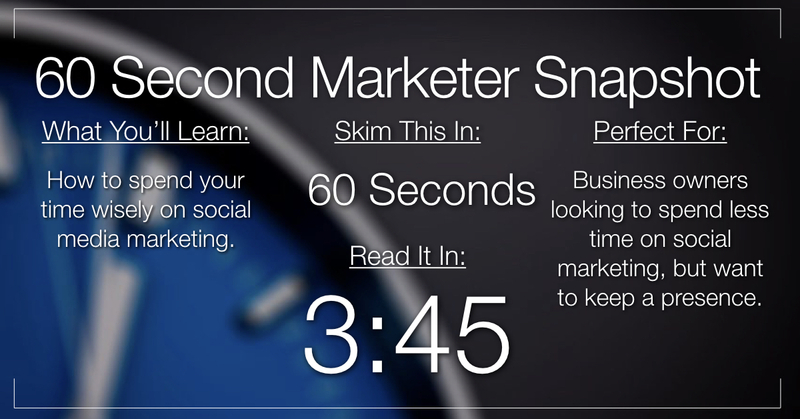 Do you have enough time for social marketing? How many hours a day should you spend on social marketing? Does 48 hours a day seem reasonable? The usual answers are to delegating, outsource and automate, but all these take resources you could use elsewhere. Forget what social media ‘experts’ tell you to do, they have their own agendas. Instead, you need to look at whether all the social media tasks on your to-do list are worthwhile. Do You Need to Do it All? If you listen to the social media gurus, you would be spending every minute of your working day on one social channel or another. You would never have another creative thought or time for strategic planning. Let’s get real; that is never going to happen. Social media channels are tools. 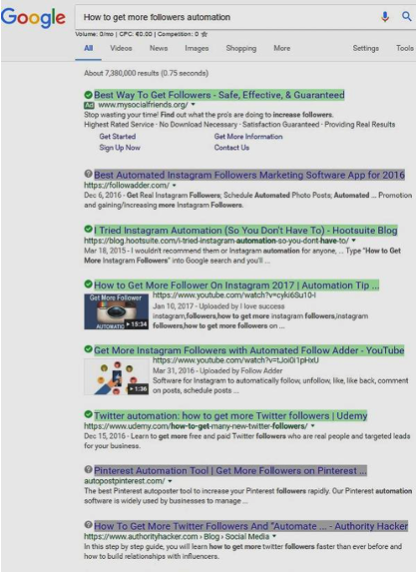 If you build your reputation using different social channels, then many of the individuals you encounter will follow you back. However, the number of followers you have is a poor measure of the quality of your social media success because only a tiny proportion of them are even remotely interested in you. The most successful entrepreneurs mostly follow the same path; that of teaching their success to others. Teaching is a great way to scale your business. There are two ways to teach, you run courses or you set yourself up as a consultant. Some entrepreneurs, such as Sam Ovens who recently featured in the Epoch Times, combine both. Consulting and running courses is certainly the ultimate way to spread your message and grow your wealth. The search screenshot above gives one reason for follower numbers being meaningless: It is all automated. Just like video killed the radio star, automation is killing genuine social media engagement. The argument that social media makes marketing a breeze for cash-strapped entrepreneurs is a lie. It might cost nothing to market a business over social media, and it might be an easy medium to use, but if you get no results then it’s a waste of your time. You should be charging your time as worth at least $50 per hour, so random social media activity is a wonderful way of throwing money away. Twitter, Facebook and their ilk are primarily communication channels you can use to talk to leads and customers. You need to spend time on social media, but it must be highly focused, and you need to use your precious time to engage with leads, not random followers who have zero interest in you or your products. You have social media icons on your site so anyone who is interested in you or your products can see what you post. But they never see what you are doing. Followers have rarely shown more than a passing interest in you, so they do not count as leads. Worse, many of the reactions to your content are automated, and it is a waste of your time to try to engage with robots. The typical Twitter feed shows hundreds of new tweets every hour, so your tweets are never going to be seen, let alone read or acted upon. What’s the point of spending hours on Facebook when most of your contacts never see your posts? 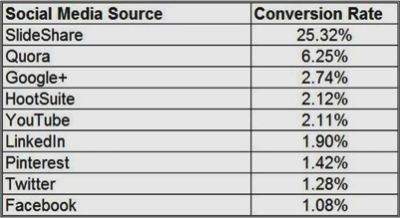 As the above conversion chart from social media experts SocialMediaToday.com shows, social media channels do not convert. How Can You Convert Social Media Leads into Sales? There is an answer, but it is time-consuming, just like every other business task that is going to increase sales. Following back, retweeting and similar actions are unlikely to bear fruit, so don’t waste your precious time on them. The answer is genuine interaction. The best way to convert ‘Likes’ and ‘Follows’ into sales is by immediate contact by email or phone. Any lower level of engagement is throwing the ball to your opponent. The good news is that you can delegate these responses to your sales team. Social marketing is important and useful if you do it right. The “gurus” who tell you to spend 2 hours a day tweeting and posting, know that you don’t have the time to follow their advice. Their purpose is to convince you to buy their latest automation products as the only way to fit everything into your day. You can use social media to build brand awareness and as a marketing channel for those who are already converted to your brand. 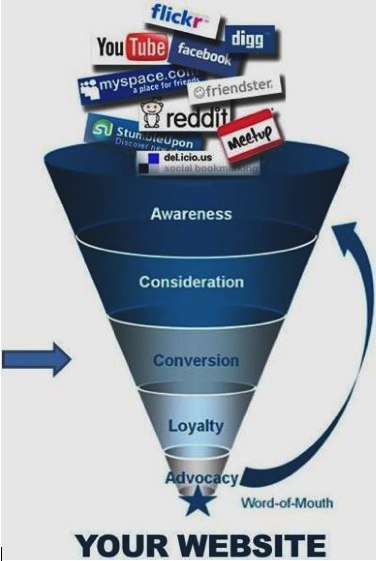 However, all marketing funnel illustrations have one flaw; they imply there is a linear progression from the number of people aware of your brand to the number who will buy your products. This is unlikely to be the case, and the mouth of the funnel should be ten times the diameter in relation to the ‘consideration’ stage. If your only point of contacting people on social media is to turn them into buyers, then you need to reconsider how you spend your time, because it isn’t worth the time or effort.